For the last four years, local hospice Martin House have staged a ‘Strictly Get Dancing’ competition to raise funds for their work helping children and young people with life-limiting conditions. The event takes place at The Engine Shed in Wetherby, just down the road from our Tockwith facility. We’ve helped out in previous years and were more than happy to do so again this year, supplying and installing forty of our stock hangar staging units to create elevated platforms that accommodated the venue’s seating and enhanced the audience experience. The competition is a very popular local event and is always well supported with a large audience providing encouragement to all the contestants. 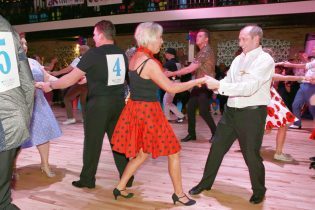 This year, each of the fourteen couples danced a Charleston, a quick step, and a group jive in front of a panel of judges that included ITV Calendar presenter Christine Talbot, Emmerdale’s Jeff Hordley, Martin House dad Roger Fielding and head judge Laura Hatton of Northern Ballet. This year the event raised almost £30,000. You can make this amount even more impressive, here! 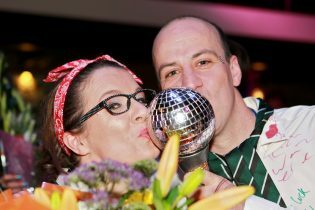 Congratulations to Nicole and Lee Connor who triumphed to take home the glitter ball trophy!